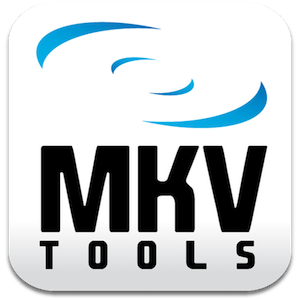 MKVtools is the part of the VIDEOtoolbox Suite of Applications used for the creation and editing of MKV videos. For users of the original MVtools (i.e., MKVtools 2), the naming convention could be a bit confusing. This is a new and improved version of the application which will focus on what the original version was not very good at - the creation and editing of MKV files. It will not, however, create MP4 or AVI files. If you are looking to convert videos to either MP4 or AVI videos, then you should try either M4tools or AVItools. As the name might imply, MKVtools is a graphical interface for a variety of tools useful for processing video files. • Convert from a variety of video file formats like MKV, MP4, OGM and AVI into MKV videos..
• Can convert most videos without having to re-encode the video track and/or the audio track, so processing takes minutes instead of hours and no quality is lost. • Simplified, intuitive user interface that takes the guess work out of processing MKV videos. • Ability to convert various surround sound audio to 5.1 AC3 or 5.1 AAC. • Intuitively select desired video, audio and/or subtitle tracks to process, with the ability to verify the selections using video preview. • Define presets for one step automated encoding and track selections settings. • Burn (i.e., hard code) subtitle tracks into the video, or mux (soft subtitles) from internal tracks or from external subtitle files commonly found on the internet. • Control the font, size and positioning of the embedded subtitles. • Split MKV videos into segments of a specified file size or by start/end time. • Turn off an MKV video's header removal compression to allow more compatibility with playback and editing. • Extract the selected tracks from MKV videos as individual video and/or audio files. • Add jobs to a queue either individually or in batches via drag and drop so you can process multiple files overnight (registered copies only). • Apply one setting to a group of files for easy batch creations (registered copies only). • Enter a "Watch Mode" for which MKVtools will process all videos placed in a defined folder (registered copies only).